Alexander Sweet was noted for his interest in horticultural matters; he wrote the book “Villa and Cottage Gardening specially adapted for Scotland, Northern England and Ireland”; published in 1889 which ran to several editions. He was editor of, and also contributed articles to, the Scottish Gardener and Northern Forester. It is the August 1908 issue that has the surprising inclusion of a Sweet family history. A copy of this is reproduced in the history of the Harvey family in Australia; Mary Shirra Sweet (1840 to 1921) who emigrated to Australia with her parents Ann Sweet (1801 to 1879) and Robert Sweet (1798 to 1866) from Yetholm, married George Sturgeon Harvey in 1864 in Australia. Mary Wilson Dunn Sweet from Craigshields, Skelmorlie, Scotland corresponded with Robert Sweet McDonald and after his death with his widow and daughters. Robert was a son-in-law of Robert and Ann Sweet, (see “Australian connection”). 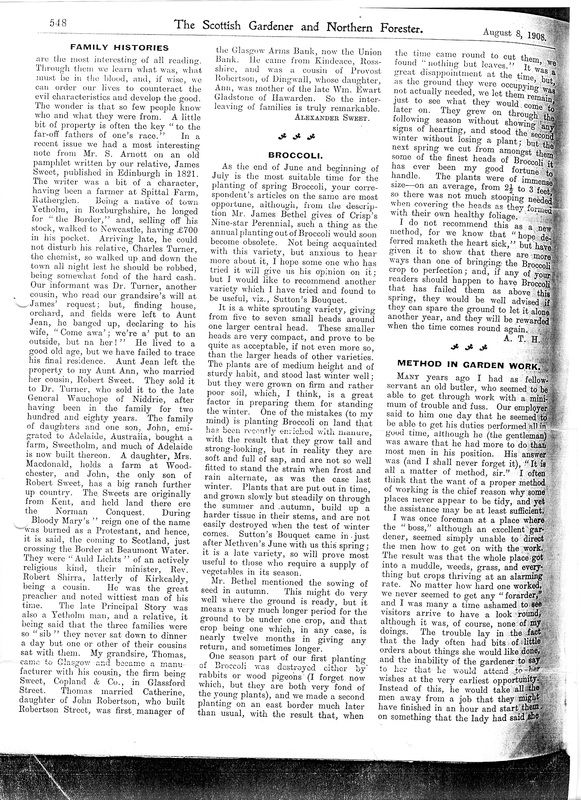 Click here to view the Northern Forester article 1908. “our relative, James Sweet…a native of town Yetholm”. James was born in 1756 (died after 1841) and christened in Garvald a son to George Sweet (1725 to 1809) and Ann Lyon (born 1721). George was gardener and servant to Major Dalrymple of Nunraw, near Garvald. In 1758, George’s father bequeathed Sweetholm in Town Yetholm to George. I presume that he moved there and operated the market garden (which is now allotments) and raised his family, which included James. I don’t have any records relating to Spittal Farm, Rutherglen, referred to in the article, or James’ time there. James was the third son but I suspect the first two died in infancy. “but, finding house, orchard and fields were left to Aunt Jean he banged up…” George died in 1809 and it is his will that was being read. The eldest living child was Elizabeth Sweet (1752 to 1820), who by this time was married to James Elliot (1753 to 1810) in Yetholm. James Sweet was the eldest living son and clearly farming at Spittal Farm. Thomas (1758 to 1848), the next in line, was already established in Glasgow. Jean (born 1763) had married Archibald Hogarth (1786 to 1868) in 1807. There was a George (1768 to 1828) [junior] who had also started to make his way in Glasgow. He was followed by Walter (born 1771), Anne (born 1773) and Jane (born 1776) for whom I have not found any further detail. Quite why the property was left to Jean is not clear to me but this is what is recorded in the property deeds. As are the subsequent transactions mentioned. “The family of daughters and one son emigrated to Adelaide, Australia, bought a farm, Sweet holm, and much of Adelaide is built thereon.. a daughter, Mrs McDonald, holds a farm at Woodchester …. and John has a big ranch further up country.” At Woodchester, South Australia there is a farm “Sweet’s Cottage”, which I have visited. The parents, Ann (1801 to 1879) and Robert (1798 to 1866), are buried in a cemetery outside Woodchester. Jane Sweet (1836 to 1911), who was the schoolteacher in Woodchester, married Alexander McDonald (1823 to 1904) and they farmed first at Bremer and then Red Creek, all in the locality of Woodchester; this will be the Mrs McDonald in the article. The property that became Sweet’s Cottage was sold by the S.A. Government in 1853 to a Mr. Mark Morris and he sold this to Robert Sweet, farmer, Woodchester in 1863. Robert’s daughter, Jane, applied to be the schoolteacher at Woodchester in 1860. So it is pretty certain that the Sweets were in Woodchester some time before 1860 and possibly Robert rented or managed a farm in the area to be described as a farmer, Woodchester. Woodchester is some distance from Adelaide but Russell Sweet of Sydney thinks that before moving to Woodchester, the Sweets farmed in Hindmarsh, which is now a suburb of Adelaide. In the South Australian Government Gazette for June 1863 there is an entry for unclaimed letters showing Robert Sweet, Sweet’s Station, near Adelaide. Could this be where he was prior to going to Woodchester? While this may “fit” with Alexander’s recollection, I have no proof of this as yet. See the Australian connection for more details. John Sweet (1842-1919) was Robert’s son and he did seem to farm at a number of places in South Australia. “Rev Robert Shirra, latterly of Kirkcaldy being a cousin”. Robert Shirra (1758 – 1840) who was a minister in Yetholm was a nephew of the renowned preacher of Kirkcaldy (referred to here by Alexander and whose dates were 1724 to 1803); he was in Kirkcaldy all his ministerial life. They were both secessionists (“Auld Lichts”). “Our” Robert Shirra’s son, George, married a Mary Gibb; he took the name George Shirra Gibb and farmed at Lochtower in Yetholm. He wrote “A Farmer’s Fifty Years in Lauderdale”. I have not as yet proved the relationship between Sweet and Shirra. “The late Principal Story, also a Yetholm Man, and a relative”. There was a Rev Robert Story who was minister at Rosneath and who, in the 1851 census, gave his place of birth as Yetholm. His son, also Robert Story, born 1835, after a number of ministerial appointments moved in 1887 to the University of Glasgow as Professor of Church History and in 1898 became the Principal. He died in 1907. (Wikipedia) So it may be that this is the aforementioned but again, I have not yet found the relationship to Sweet. “My grandsire, Thomas, came to Glasgow and became a manufacturer with his cousin .. Sweet, Copland & Co”. There is a case brought to the Edinburgh Courts of Session in 1786: Copland Sweet and Company Merchants in Glasgow pursued against Inglis and Gibson Merchants in Jamaica and John Gibson, Officer of Excise, late in Glasgow and now of Airdrie defenders. There are other references to the partnership pursuing debts in 1784. These cases indicate that the firm was in existence prior to 1784 and active in the trade with the West Indies. Later references appear as Hogg, Copland and Sweet, suggesting that Hogg was introduced as a partner, possibly after 1788. It appears to have had some trouble and all three partners were declared bankrupt in 1789. Thomas went on to be the Quartermaster, or Billet Master for the City of Glasgow from (at least) 1811 until1848. It is strange that Alexander Sweet does not mention this in this article, I know for a fact that he did know of Thomas’ employment. A William Copland married Jean Robertson (born 1759) in 1786, she was an Aunt to Catherine Robertson (1770 – 1832) , Thomas Sweet’s wife, and this is where the family connection mentioned in the article is confirmed. William Copland and Jean Robertson had a son, also William Copland (1788 to 1836) but I think it is the former who is the subject in this partnership. “Notice to the creditors of the late John Robertson, Banker and Merchant in Glasgow. It appears pretty conclusive that the Arms bank could not have been absorbed by the Union Bank, indeed the Glasgow Union Banking Company (the forerunner of the Union Bank of Scotland) was only formed in 1830. Alexander Sweet himself worked for the Union Bank from 1864 until 1915 in the Accountant’s Department, so it is all the more surprising that he has made this error of recall. “He [John Robertson] was a cousin of Provost Robertson of Dingwall whose daughter, Ann was mother to the late Wm Ewart Gladstone”. This is confirmed in the book “The Robertsons of Kindeace” published in 1895. “Arriving late he could not disturb his relative, Charles Turner, the chemist…….Our informant was Dr Turner, another cousin..” In 1790 Elizabeth Sweet married George Turner in the Chapelry St John, Newcastle according to transcriptions from Durham and Northumberland Records on line. I have not yet been able to tie Elizabeth Sweet into my tree but speculate that there is a connection here and may even link into the Edgely conundrum. George Turner could be a brother of Charles or could be the Doctor. In 1799 a Charles Turner graduated from Edinburgh University with a M.D. Grizel Sweet in Town Yetholm married Robert Turner about 1744 and had seven children, one of whom died and of the remaining six, four were male. It is possible there is a Turner connection here which might lead back to Newcastle. The court documents relating to Grizel’s dispute with her brother George confirm that her sister Jean Sweet (Wilkinson) lived in Newcastle.